Product Information - Installers and consumers alike still love Component Video Cables. Why? You don't have the sync and drop out issues that are common with so many of the digital cables. Plus if your device can support it you can get up to 1080i out of component video cables. Today all newer set top boxes for Cable, Satellite along with Blu-Ray and DVD players are equipped with component video jacks. Component video connections give you a better picture than either composite or S-video, so you get sharper detail and more natural, lifelike colors. Our component video cables help your video gear deliver the best possible picture. With our cables you get performance from connector to connector without the high prices. Our cables are quality - allowing jitter-free transfer of digital signals. The low-loss cable design includes pure copper center conductor and shielding to preserve signal strength and minimize noise. Gold plated, RCA connectors and pins to give you solid, corrosion-free contact. Why Component Video? 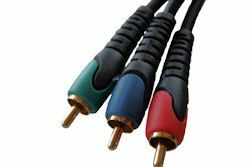 - Component Video Cables are the ideal choice for connecting your today's electronics together with high-end television. By using Component Video Cables, you bypass the TV's Y/C separator and Color Decoder, routing the color (Y, Cr, Cb ) information directly into the TV's matrix decoder. By sending the pure component video signal directly to a component video input-equipped display device, the signal forgoes the extra processing that normally would degrade the image. The result is a vastly increased image quality, with incredibly lifelike colors and crisp detail. Home Theater Packaged individually in poly bags and ready for immediate use. This HDTV RGB Video Cable is specifically designed to provide the sharpest, clearest video for your home theater system. Component Video can support resolutions of up to 1080i from a video source. The video source and display are the determining factors in the video output resolution.